Richard Linklater has cultivated a career based on two slightly clashing recurring interests: continual experimentation with the passing of time on film, and a love for the outsider and wanderer. As a result, Last Flag Flying is something of an anomaly because of its deceptively straightforward nature in the context of his oeuvre. A spiritual to Hal Ashby’s seminal The Last Detail co-written by the original novelist, the movie is at first glance a standard Iraq War drama. But this is first-and-foremost a Richard Linklater film, and through the lengthy, considered conversations that form its backbone the catharsis is generated naturally and truthfully. I should note at this point that I haven’t seen the ostensible predecessor to Last Flag Flying, and while there are many seeming allusions to events that would logically have happened in The Last Detail, most of the references are apparently fashioned for the film or the novel it’s based on, and not the prior sources: the character names have been changed, their military branch has been altered from the Navy to the Marines, etc. Suffice it to say, then, that Last Flag Flying is a film founded upon memory, and indeed the film itself has the semblance of memory. Set in December 2003, at the height of the Iraq War, it follows three former Marines – Sal (Bryan Cranston), Larry (Steve Carell), and Richard (Laurence Fishburne) – as they journey together to bury Larry’s only son, who has been killed in combat. Along the way, Larry Jr.’s death is revealed to be in considerably more ignoble circumstances than officially stated, setting in a strong anti-government, and, indeed, an anti-war streak that characterizes much of the second half, as the men decide to bury the soldier at home rather than at Arlington. 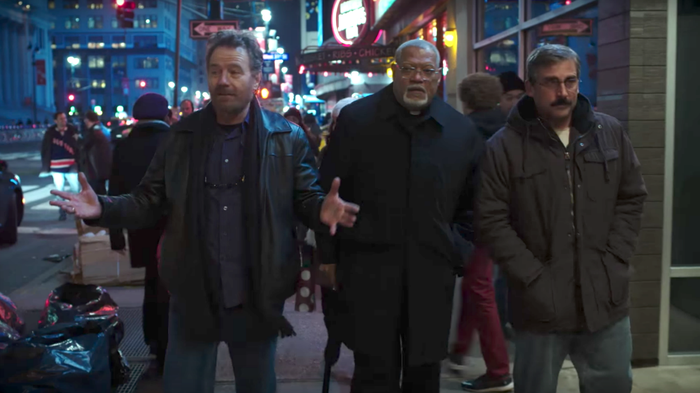 But Last Flag Flying is, first and foremost, a film wholly dedicated to its characters, to the point of being almost hermetically sealed into the bubble of three, maybe four characters. Their personalities, and the performances that guide them, run the gamut: Sal is a hard-drinking bar owner with a plate in his head, constantly provoking and bragging; Larry, slightly younger and less committed to the military than his friends is immensely quiet and recessive; Richard, formerly a legend with the bottle and the women, is now a committed Baptist pastor. The three meld surprisingly well, a testament to both their easy-going, never too insistent lines of patter and Linklater’s ability to juggle a variety of running “subplots” while retaining an essential subject of camaraderie. Last Flag Flying is what might be called a film for old men, with its frequent evocations of the brotherhood of the military, the obsession with duty, if not a source of rampant jingoism – Larry’s quiet pain is compared with Saddam Hussein’s capture and the death of his own sons, and he holds no small amount of sympathy for the despot. This last detail, in conjunction with the odd fascination that Sal holds with the burgeoning Internet and cellular phones, points to something vital to the film: it couldn’t have been made at the time in which it is set. Much of the sadness and soberness, especially that which is barely masked in Sal’s character, comes from the retrospective look that cools many of the flaming passions that might have engulfed a more hastily made film. These are old men, something which Linklater’s steady, only occasionally energetic camera captures with just the right sense of weariness, and their mission is one done out of love rather than duty.